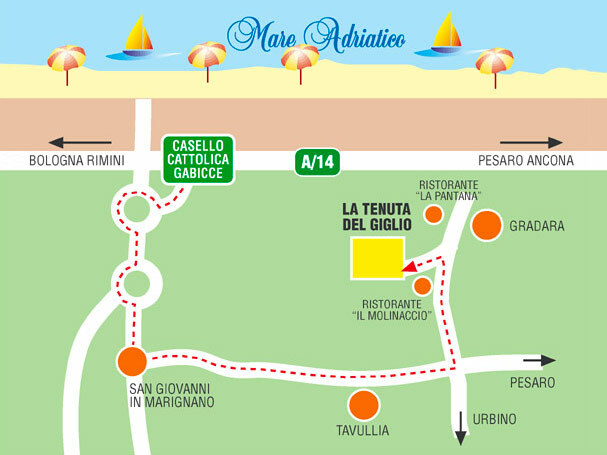 Where We Are | La Tenuta del Giglio – Bed and Breakfast Tavullia. Marche, Italia. High quality Bed and Breakfast Italy. You can reach “LA TENUTA” from the A14 motorway: take the Cattolica-Gabicce Mare exit, follow the road signs for Gradara and drive towards Tavullia; or pass through San Giovanni in Marignano, go past Tavullia and turn into Strada Monteluro in the direction of Gradara.